Henry IV, Part 1 was almost certainly written in late 1596 or early 1597, shortly before its first performance. It was first published in 1598 as The History of Henrie the Fourth, apparently to advertise a change to the name of one of the principal characters. The first performances had led William Brooke, 10th Lord Cobham, to object to Shakespeare’s use of the name Sir John Oldcastle, the Lollard martyr who had been the 4th Lord Cobham. In the earliest quarto, Shakespeare’s character had become Sir John Falstaff. None of the quarto editions refer to The History of Henrie the Fourth as the first of two plays. There is no evidence to link its creation to that of Henry IV, Part 2, and it is now generally believed that the second play was only begun after the success of the first. It seems likely that Henry IV, Part 1 was first performed early in 1597 by the Lord Chamberlain’s Men, perhaps at the Theatre. The original cast is unknown, but Richard Burbage may have played Prince Hal, with Augustine Phillips as King Henry, and William Sly as Hotspur. It is possible that Shakespeare himself played the King, rather than Phillips. There is no certainty as to who played Falstaff, the character chiefly responsible for the play’s popularity. Either William Kemp or Thomas Pope, both leading comic actors with the Lord Chamberlain’s Men, could have created the role. Kemp might have passed it to Thomas Pope when he left the company in 1599. Falstaff was later played by John Lowin, who replaced Pope. The only certain early performances were all for royalty or aristocracy. Lord Hunsdon entertained the Flemish ambassador Ludovik Verreyken with the play in March 1600. Henry IV, Part 1 was one of 20 plays performed by the King’s Men during the celebrations for the marriage of the Princess Elizabeth to Frederick, Elector Palatine in the Winter of 1612-1613. The play was performed at the palace of Whitehall on New Year’s night 1624-1625, and it is likely to have been the play referred to as ‘Olde Castell’ performed at court on 6 January 1631. The ‘ould Castel’ performed at court on 29 May 1638 is also likely to have been Shakespeare’s play. 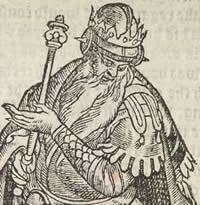 Henry IV, Part 1 appeared in 11 editions before 1642. First quarto, 1598. Apparently printed from quarto 0. Comparisons between the first quarto and its incomplete predecessor suggest that the former was printed with some care for its accuracy. Second quarto, 1599. Printed from the first quarto. Fourth quarto, 1608. Printed from the third quarto. Fifth quarto, 1613. Printed from the fourth quarto. Sixth quarto, 1622. Printed from the fifth quarto. First folio, 1623. Printed from the fifth quarto, with some editorial amendments. It is possible that the folio’s editors collated a copy of the fifth quarto with a manuscript version of the play, perhaps the acting company’s promptbook. Seventh quarto, 1632. Printed from the sixth quarto. Eighth quarto, 1639. Printed from the seventh quarto. Andrew Wise entered ‘The historye of Henry the iiijth’ on the Stationers’ Register on 25 February 1598. He published two editions that same year, both printed for him by Peter Short, the second of which is now referred to as the first quarto. The second quarto was printed for Wise in 1599, by Simon Stafford. In 1603, Wise transferred his copyright in the play to Mathew Law, who entered it on the Stationers’ Register on 25 June 1603 as ‘Henry the. 4 the firste parte’. Law did not acquire the copyright to Henry IV, Part 2, although that play was also already in print. The third quarto was printed by Valentine Simmes for Law in 1604. In 1608, John Windet printed the fourth quarto for Law, and in 1613 William White printed the fifth quarto, again for Mathew Law. The sixth quarto did not appear until 1622, and was printed for Law by Thomas Purfoot. The seventh quarto was printed by John Norton for William Sheares in 1632. The eighth quarto was again printed by John Norton, this time for Hugh Perry in 1639. British Library copies of Henry IV, Part 1 contains detailed bibliographic descriptions of all the quarto copies of the play. Three sources were particularly important for the creation of Henry IV, Part 1. Raphael Holinshed, The Third Volume of Chronicles (1587). Shakespeare used Holinshed for the events in the play, particularly the revolt by the Percy family in 1402-1403, as well as his principal characters. Samuel Daniel, The First Fowre Bookes of the Ciuile Warres between the Two Houses of Lancaster and Yorke (1595). Daniel’s work, as well as Holinshed’s, provided the historical core of the play. The Famous Victories of Henry the Fifth (1598). Despite its publication date, this anonymous play was probably performed from the late 1580s. Shakespeare apparently drew on its mix of history and comedy, and it may have inspired his tavern scenes between Prince Hal and Falstaff, as well as his development of the Prince’s character from a dissolute youth to a responsible soldier. Henry IV, Part 1 is set at the beginning of the 15th century, following King Henry’s usurpation of the throne and the murder of his predecessor King Richard II. (Act 1) The King receives news of civil unrest in his kingdom, and postpones his promised pilgrimage to Jerusalem to atone for King Richard’s death. His eldest son, Prince Henry (known as Hal) drinks and carouses with Sir John Falstaff and his followers. The King refuses to ransom Mortimer, the brother-in-law of Henry Percy (known as Hotspur), who has been captured by the Welsh rebel Owen Glendower. Hotspur, his father Northumberland, and Worcester (Northumberland’s brother) plot a rebellion against King Henry. (Act 2) Falstaff and his followers rob carriers taking money to the King. After the robbery Prince Hal sets upon them, and Falstaff and his men run away, abandoning their booty. Falstaff lies about his cowardice to the Prince, who reveals the truth. During their merriment, news arrives of the outbreak of civil war with the King’s order for Prince Hal to join him against the rebels. (Act 3) Hotspur, Northumberland, and Worcester have joined Mortimer and Glendower in rebellion against the King. King Henry gives Prince Hal a command in the army he has gathered against the rebels. The Prince procures a company of men for Falstaff. (Act 4) King Henry offers Hotspur and his followers redress of their grievances and pardon if they will end their rebellion. In response to Worcester’s separate declaration of his complaints against the King, Prince Hal offers to settle the matter in single combat with Hotspur. Worcester conceals the offer from Hotspur, making battle inevitable. (Act 5) During the Battle of Shrewsbury, the Prince saves his father King Henry in his combat with the Scots rebel Douglas, and then fights with and kills Hotspur. Falstaff carries off Hotspur’s body and pretends that he has killed him, but the Prince exposes him as a liar. The royal forces win the day, but immediately make plans to face the rebels under Northumberland at York, as well as those commanded by Glendower and Mortimer in Wales.